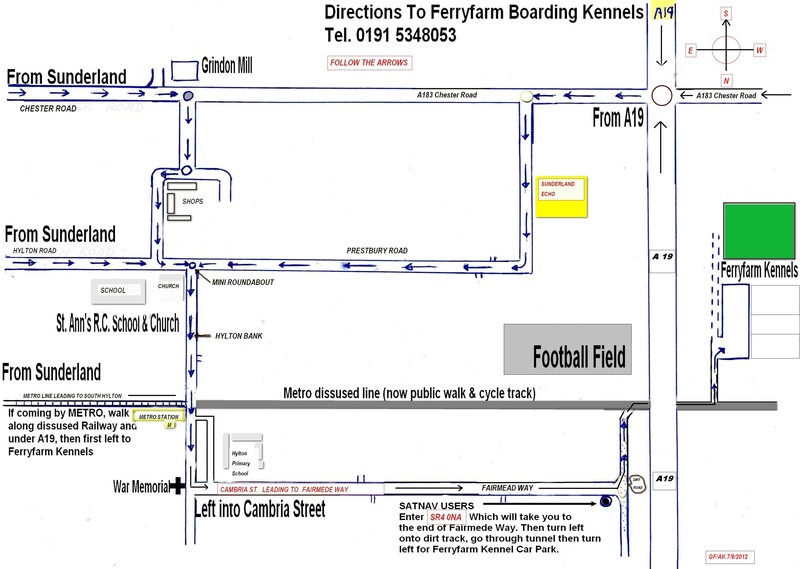 How to get to Ferry Farm. From the A19, take the A183 for Sunderland -right if coming from the south, left if coming from the north. Turn left at the first roundabout (a couple of hundred yards) and follow the road (Hylton Road) round (you will drive past the Sunderland Echo offices on your left) until you come to a roundabout with a sign indicating South Hylton and turn left. Go down the South Hylton Bank. Halfway down is the Metro terminus on the right. Just past that on the left is Cambria Street. There is a shop on the corner with a phone number in large green letters. Turn left along Cambria Street. Go to the very end to the base of the embankment. Turn left up a dirt track. Go through a tunnel and turn sharp left and you’re there. The nearest post code for Sat Nav is SR4 0NA but do not turn left up a street, continue on as above. By public transport. Directly opposite the Metro terminus is a country lane which takes you directly to the tunnel. There is a bus stop near the terminus. For general enquiries by post, please use the main shop address below. Alternatively complete the contact form.